Reactive oxygen species (ROS) which include free radicals, peroxides, singlet oxygen, ozone, and nitrogen monoxide and dioxide free radicals, is an area of intense research. 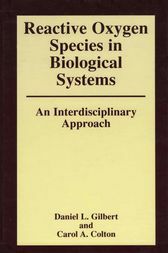 This volume covers (1) the destruction of cellular function by ROS resulting in pathological states; (2) the protection by ROS of an organism against invading organisms that cause infections; and (3) the role of ROS in normal physiological processes. Designed for beginning graduate students, this book gives a concise overview of the field.